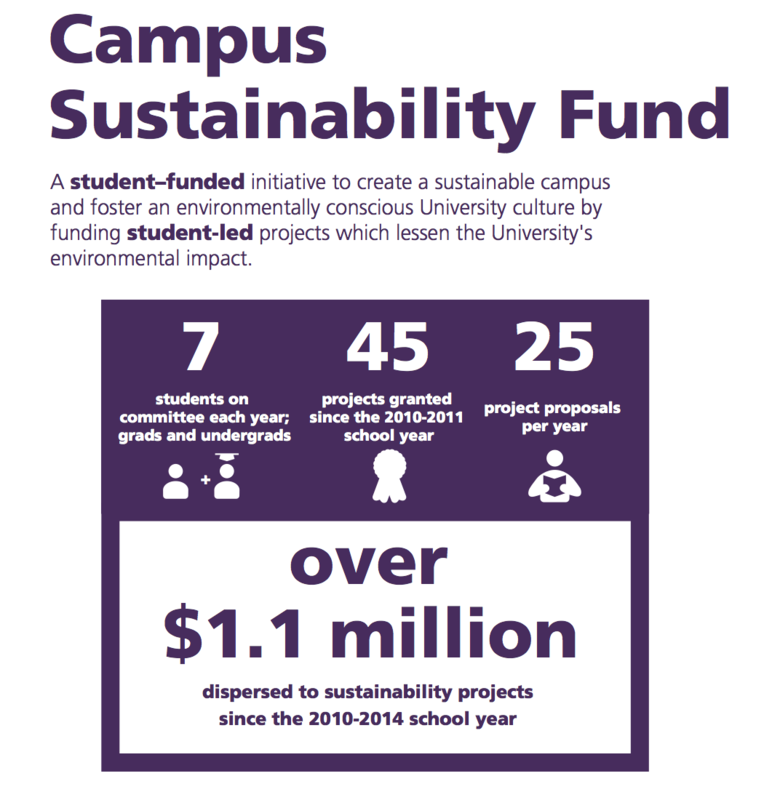 Two Grant Funds are available at the University of Washington for students, faculty, and staff to apply for funding for projects that reduce the environmental impact of our campus. The Campus Sustainability Fund and the Green Seed Fund each have different goals and requirements. The table below may help you determine which fund is more appropriate for your project idea. Varies each year, typically around $300,000 available for projects. Varies each year, typically around $250,000 available for projects. Approximately $100 to $90,000+. Approximately $25,000 to $75,000. Small Project applications (less than $1,000) accepted throughout the main academic year (not Summer Quarter). Large Project applications (more than $1,000) accepted during two funding cycles. The first round starts in late Fall Quarter, the second round starts in late Winter Quarter. One funding cycle, the application deadline is in late Fall Quarter. One day event to a few years. Student involvement is a strong focus and a requirement, faculty and staff should be involved as needed for approval and oversight. Projects require at least one student, one faculty, and one staff member. To create a sustainable campus and foster an environmentally conscious University culture by funding student-led projects that lessen the University's environmental impact. 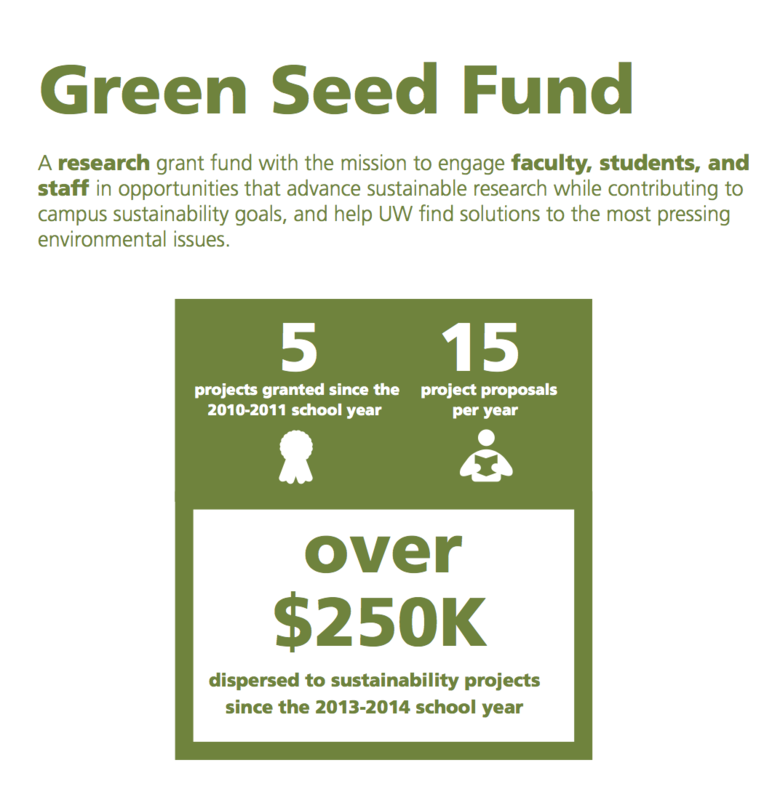 To engage faculty, students, and staff in opportunities that advance sustainable research while contributing to campus sustainability goals and help the UW find solutions to the most pressing environmental issues.